David Wenngren (aka Library Tapes) is no slouch when it comes to releases, the Swedish chap has amassed so many recordings it’s hard to keep track, but this particular album is a little different. That’s probably down to the involvement of Canadian Christopher Bissonnette, who released the gorgeous and understated ‘In Between Words’ on Kranky a while back. The restrained and elegant ambience of that underrated album translates perfectly to this collaboration as Bissonnette reforms Wenngren’s dusty sounds into elongated, gaseous drones. In a world where the mention of the word ‘drone’ seems to conjure up dark, gloomy worlds and miserable boys in black hoodies, there is something refreshingly elegiac about ‘The Meridians of Longitude and Parallels of Latitude’. While the sounds might be obscured, the emotions are worn on the musician’s sleeves, and illuminated with bright, rippling daylight. As the cover might suggest this is music for bright, autumnal landscapes; and what better time to listen than right now. 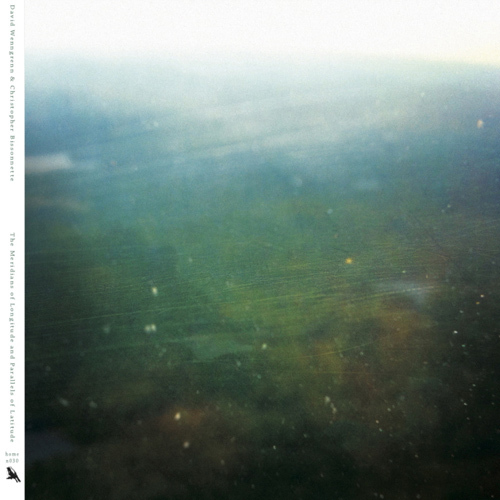 Whilst most of you will know of our love for David Wenngren (of Library Tapes fame, of course), Christopher Bissonnette’s ‘In Between Words’ release on Kranky has long been a personal favourite around these parts. So when I heard about their collaboration I almost fell over myself with excitement. The result is the beautiful and noisily freckled masterpiece ‘The Meridians of Longitude and Parallels of Latitude’, mastered by the lovely Taylor Deupree. In many ways the record is a perfect hybrid of their sound, almost the truest of collaborations if you will. It is also a true Home Normal release, fitting of our original intentions for release of works. It is of a drone-like nature, yet at once melodic, intense and possessing a naturally organic graininess and warmth we so love. The cover art is a perfect match for the sound: beautiful, serene, yet freckled and blurred like a frosty window pane. The music is that of a dream, a dusty memory of something beautiful, retaining its alluring being in that which is hidden, seen but not fully recognisable. The good thing about this dream, this memory however, is that we simply have to press the ‘play’ button again when it is over.